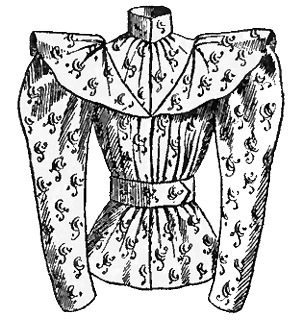 The 1890s ushered in a new style sleeve in women’s fashion. 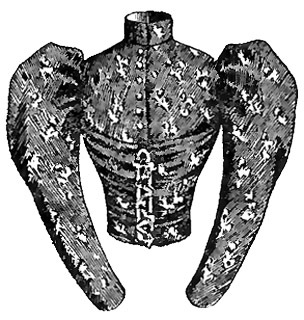 Garments now featured a high full sleeve that rose upwards above the shoulder then tapered to the wrist. 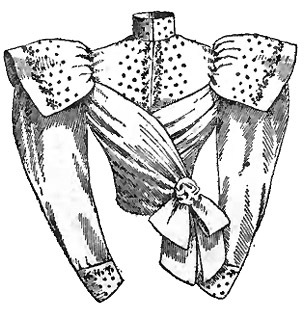 The cut of coats and capes was redesigned to accommodate the full upper sleeve. 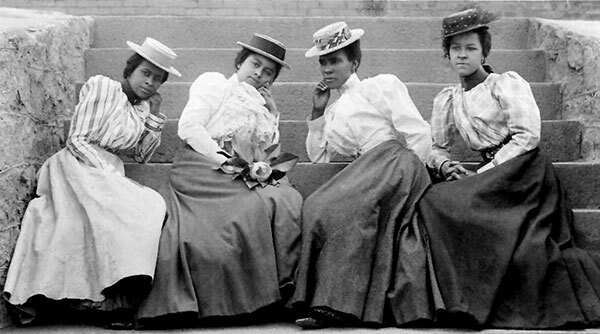 Matching fabric belts were worn that defined and accentuated the natural waistline. 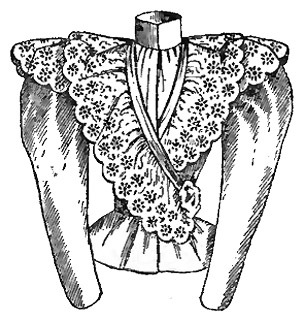 Below are examples of the new tailored style of Victorian blouses in vogue in 1894. 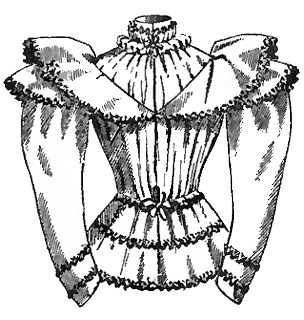 This style Victorian blouse has long sleeves that are full at the top and rise upwards above the shoulder. 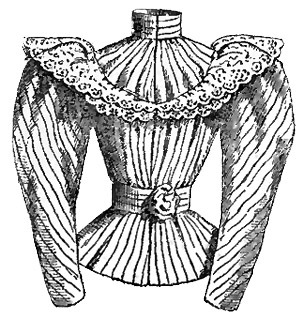 A double frill is below the high-neck collar. The matching fabric belt defines and accentuates the waist. In 1894 it was available in fancy striped crinkle cloth in sky, pink, yellow, heliotrope and gray. This Victorian blouse has a pleated bodice with a matching fabric belt worn at the natural waistline. The long sleeves are full at the top. 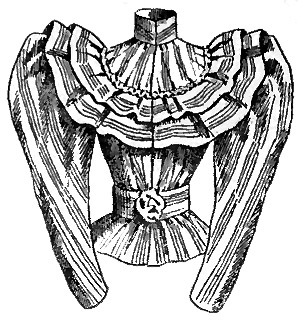 In 1894 it was available in fancy striped crinkle cloth, printed delaine, and printed summer silk. 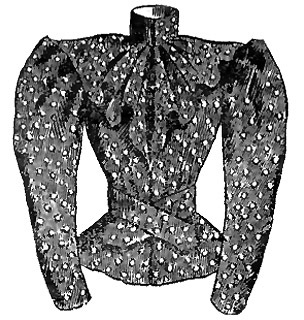 This Victorian blouse has gathered full sleeves and matching fabric belt worn at the natural waistline. In 1894 it was available in fancy striped crinkle cloth in pink, heliotrope and sky. The same style was offered in black surah. This Victorian blouse has a ruffled high collar and a tie belt. It is trimmed with rows of contrasting black gimp. It was available in pink, heliotrope and sky crepon. This white lawn Victorian blouse has a high collar and a matching fabric belt that defines and accentuates the waist.. It is trimmed with rows of wide white embroidery. This white nainsook bodice has a high boned collar and is trimmed with fine Swiss embroidery. This white nainsook serpentine waist bodice is decorated with colored embroidery trimming. It was available in sky, pink and heliotrope. This high-collared blouse has a front button closure and long tapered sleeves. It was available in dark color prints.